Carrots have always been popular among farmers. This root is used in many types of pickles, it is rich in vitamins. And how pleasing to the eye tracery of green leaves in the beds. To get a great crop of carrots, you need to know several simple rules. Carrots love the sun, so plant it in a well lit area. It is desirable that this area had good lighting all day. It is impossible to plant carrots. parsley, carrots and celery. Excellent precursors are cabbage, cucumbers, tomatoes and potatoes. In areas where frosts are not uncommon, it is better to sow early varieties of carrots. They are the most resistant to frost. To sow this kind of carrot can be immediately after warming the soil. I must say that for such storage carrots will not work. For this you need to sow varieties of long maturation. Vysielanie produce once the heat has mounted steadily. Before sowing carrot seeds tested for marriage. For this is enough seeds to fill with water. Live seeds will remain at the bottom of the tank, and the whole marriage will emerge. Before sowing seeds need to germinate. To do this, wrap them in a damp cloth, put in warm place and kept there for several days. Usually enough for three days. In the beds just prior to planting make furrows, which are then watered. The grooves should not be too small, but they do not need to do very deep. The necessary depth of 3 cm. Between adjacent grooves must not be less than fifteen centimeters. Carrot requires care. The beds must be constantly weeded. Also, don't forget to loosen them. If this is not done, the roots will acquire a curve shape. After the first leaves appear thin out the beds. Water for carrots should not feel sorry. If you water it often, roots will grow sluggish, there will be bitterness in the taste. In a season two times to fertilize. The first introduction should be a month after the seedlings emerged, and the second two months later. 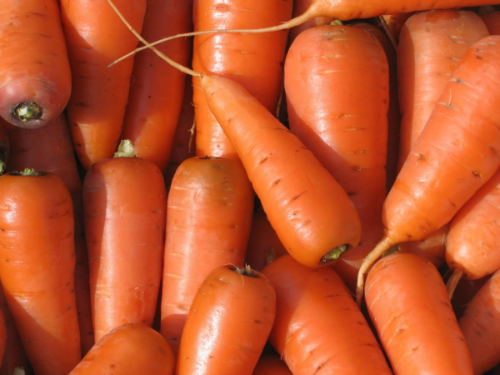 Fertilize the carrots better fertilizers in liquid form. To do this in a bucket of water diluted with two cups of ash. As a fertilizer it will be good to serve nitrophoska. In a bucket of water is enough to one tablespoon. Carrot fly is the main enemy of carrots. Its presence can be identified by swirling leaves. A one per cent solution of Bordeaux will prevent its occurrence. To prevent the leaves of the carrots treated with this solution.